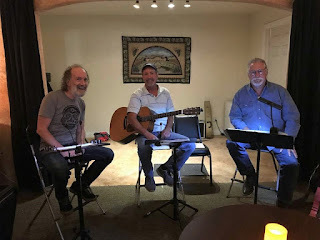 On Saturday night, Mary Kit and I had the pleasure to see The Waits at San Pasqual Winery in La Mesa, CA. 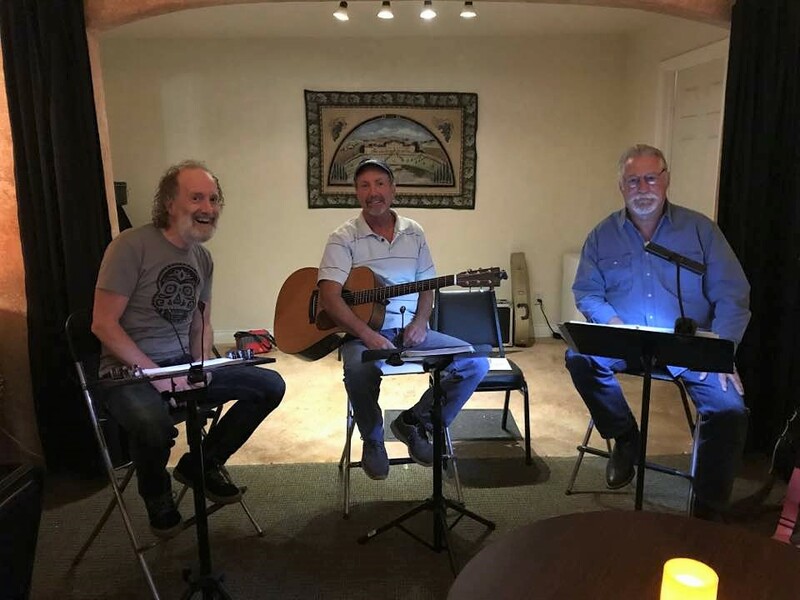 The acoustic band is Mark Hunter on guitar and vocals and Peter Lauterbach mandolin and vocals. Last night, Mark's brother, Dutch Hunter joined in as a special guest with the band and played harmonica and also backup vocals. Dutch lives in Nevada City, CA and came down to visit Mark in San Diego this past week. MK and I were thoroughly impressed as Dutch with just one practice with The Waits did a great job of improvising with harmonies and harmonica! I love this band not to mention they cover songs that every boomer knows. Pete is fabulous on mandolin as both he and Mark do great interpretations of mostly 60's-70's songs with an Americana flare. A younger couple sitting up front were very quiet and enjoying the show and I think Dutch asked them if they even knew who Herman's Hermits were? Back in the day, Mary Kit and I met Mark almost 42 years ago at the dorms at San Diego State in August, 1975. We were all community college transfers, Mark from Millbrea, CA and Mary Kit and I from Santa Maria, CA. Mark and I were in the same hallway in Toltec dorm and bonded as friends for life during the first episode of Saturday Night Live. I remember they had a big box console TV in the lobby/social gathering area of the dorm and we just started talking and laughing at this crazy new wonderful TV comedy. The next year, Mark and I moved in as college roommates and lived in a couple of different apartments together. We also were camp counselors up at Palomar Mountain for children and adults with disabilities through ARC of San Diego. It is still known to this day as Camp-A-Lot and Camp-A-Little. I have great memories of Mark playing his guitar and singing songs around the campfire with all the campers and staff. We had the pleasure to enjoy the summer mountains together while being paid $10 a day to work at the camps. Mark and I would later become teachers for students with severe disabilities as both of us had a variety of experience as teachers in San Diego County. Last night in fact, a group of Mark's old teacher friends showed up to listen to the band. Now sit back and enjoy The Waits live as MK and I recorded a few songs from the evening on our phones and made them into a YouTube Playlist. Before the first video, The intro is a shout-out to Mark's and Dutch's dad, Floyd who is 91 and a veteran of World War II who landed on the beaches of Iwo Jima. Mark once told me his dad entered the military under age at 17 and was put into one of the fiercest battles in U.S. history. The song that follows, Neil Young's Ohio is a bit ironic from his son's who grew up in a very different era during the Vietnam War near San Francisco. Anyway, Floyd has never seen Mark and Dutch play together at a venue, so Floyd this playlist was made for you! I used to listen to my old buddy sing a lot of Neil Young and all our musical heroes with his guitar on our living room floor with no more than a few dollars to stretch out together and get through the month. This just made me think of the time we were living on College Ave. in 1976 and it had been a hot hot day in sunny San Diego. We had left the front window open and when we both returned to the apartment later that day from classes, my stereo system had been stolen (my high school graduation present). I think we both heated up some tortillas on the stove, had a few peanut butter burritos and then fired up a few that night. The Waits will be performing next on May 27th at San Pasqual Winery, 8364 La Mesa Blvd. La Mesa 7-10pm.